I came across this section of a speech Pope Benedict made on September 12, 2008 at the Collège des Bernardins in Paris. It is an internal quotation from an article discussed by Fr John Zuhlsdorf, which notes, alas, that the Holy Father has not, so far, done much in the musical field as Pope, despite his evident interest in the matter and the powerful things he has said about it. 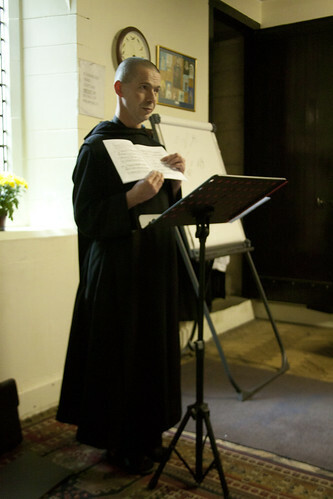 This is part of the talk he gave at the Gregorian Chant Network weekend course, 9th April this year. 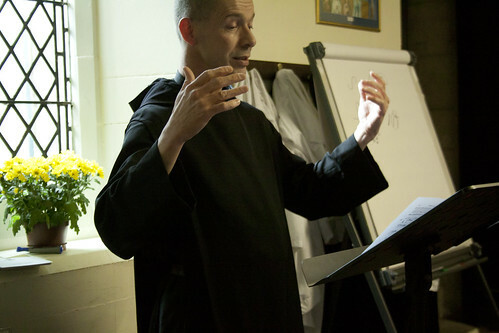 I was able to attend the 'advanced' parts of two days of the three-day workshop in St James' Spanish Place in London, led by Dom Yves-Marie Lelièvre, Choirmaster at the Abbaye Saint-Pierre de Solesmes, France. 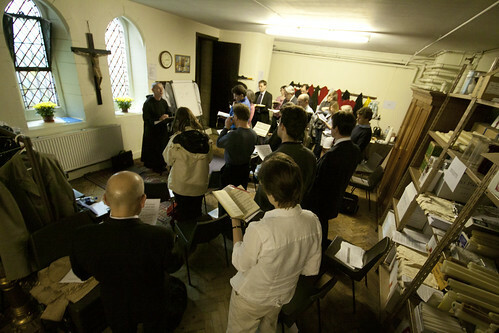 A group of about 20 singers attended all or part of the advanced singers' sessions with Dom Lelièvre, in which he introduced propers for the Masses and Vespers which were to be sung. He approached it from the Graduale Triplex, but showed us photocopies of the manuscripts upon which the Triplex is based. He also discussed the history of the modern chant editions: the 1908 Vatican edition of the Graduale Romanum, and the Antiphonales of 1912 and 1932. New editions, based on the research which has built up over the last century, are now finally appearing. But above all we sang the pieces. 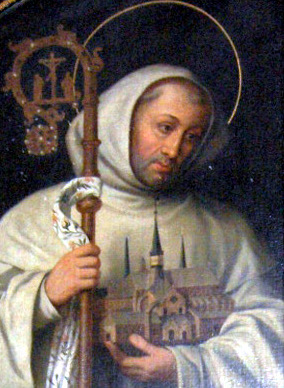 Dom Lelièvre is an engaging teacher, with a complete mastery of the Gregorian canon and great sensitivity to its interpretation. His approach places the text first: he urged us to understand the text and pray it from our hearts as we sang. The melodies serve the text, and not the other way round. His interpretation was the opposite of mechanical and rigid; some issues simply depend on the accoustics of the church, for example. We had to watch his marvellously expressive hands while we sang - ideally, he said, we should know the piece by heart. Not only was it a very interesting two days from a musical point of view, but it was a great gathering of singers from all over the South East of England and even overseas. It was organised with great efficiency by Candy Bartoldus who directs the choir at Spanish Place. 2. Saturday 28th May: Workshop day with Philip Duffy (Schola Gregoriana of Cambridge) on the First Vespers for the Nativity of the Blessed Virgin Mary from English sources the 13th century Worcester Antiphoner and the Hereford Breviary. 10-5.30 at St. Thomas's Church, Burgate, Canterbury CT1 2HJ; includes a visit to Canterbury Cathedral Archives for a talk on mediaeval music manuscripts and a small exhibition of documents. We will sing the Vespers in St. Thomas's Church at 5pm. Cost members £15, non-members £30.